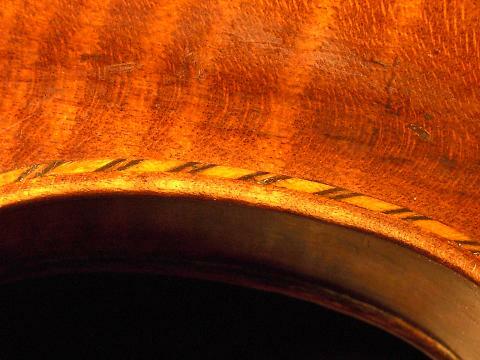 I have a violin with an indistinct brand, Longman & something or other, and I thought to have a closer look at it. It actually reads Longman, Lukey & Co., No. 26, Cheapside, London. Its unusual feature is the peculiar chevron stringing around the edges, in place of the conventional purfling. Longman instruments – woodwind and keyboard as well as stringed instruments – often have a little extra flamboyance. Their square pianos, for example, have the company’s name on a beautiful oval white ceramic plaque, instead of merely being painted onto the faciaboard like everybody else’s. James Longman started his business in 1767, and took Charles Lukey as a partner two years later, in 1769. Between 1769 and 1773 the brand reads as my one does, but it changes in 1773, when Francis Fane Broderip joined the business. Thereafter the stamp includes the name Broderip. So my violin dates from 1769 to 1773. But who made it? Henry Jay, who supplied Longman, was working from around 1740 until his death in 1776. He can be discounted. His work is generally rather poor, and he seldom purfled his instruments, let alone made the elaborate decoration of this example. John Carter, another outworker, is unlikely, as he started work around 1772. The work is not like that of Benjamin Banks. Banks supplied Longman & Broderip, but it is unclear when he started this practice. Albert Cooper considers this to be around 1770, so again, it is unlikely that he is early enough. David Furber (1725-1787) probably supplied Longman & Co. (that is, 1767-1769) but I cannot find any record that he worked for Longman after this date. Lockey Hill, though, is a bullseye. He was born in 1756 and died in 1810. Most of his instruments were indeed made for Longman, starting from around 1767 when Longman was by himself, and continuing until the firm’s bankruptcy in 1798. The excellent book, The British Violin states that most of his instruments are thinly varnished and have painted purfling, but that “Exceptionally he did use a deeper golden varnish . . . and some violins made for Longman & Broderip even have a rather gaudy guitar-type ebony and maple banding in place of conventional purfling.” Also my violin is of the same narrow-waisted Stainer model, and of exactly the same dimensions as the example by Lockey Hill illustrated in the book. The British Violin taught me many things I did not know before its publication, among which was the fact that instruments made for Longman generally have two small, curious gouged channels on the inner edge of the back. They are on the treble side of the neck root and the bass side of the end-pin, and their function is unknown. They are usually filled with a sliver of maple. Bingo. Here’s my attempt at a close-up photo.